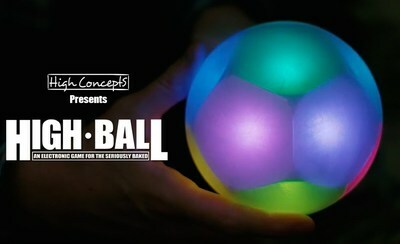 NEW YORK, April 17, 2019 /PRNewswire/ -- High Concepts, a startup making toys and games that are more fun when you're high, introduces our debut product: The High Ball ? the world's first patented, interactive, motion-sensing game designed with the high in mind. The High Ball launched on Kickstarter April 15th. It features two modes: High and Really High ? one mode for when you're a bit lit and want an exciting challenge, and one for entertaining yourself when you're thoroughly bazooped. High Mode involves locating a single colored panel from the High Ball's 12 independently LED-lit zones. Increasingly subtle shades of colored panels must be navigated in order to progress and set the high score over the course of seven rounds. In Really High Mode players encounter four Really High visual and auditory experiences. There's no score, there's no winning or losing, it's just fun to play with ? especially if you're super high. The design is the result of a collaboration by father-daughter duo Jim and Lila Becker. Over the past 30 years, Jim has created beloved kid's toys with his design firms Becker&Mayer! and SmartLab toys. His daughter, Lila, is a toy creator for Dutch design firm Fugafour. The challenge of this project, Jim says, was to re-tool their design instincts for an older, higher, player: "Lila and I have been building things together since she was a little girl. But after years of collaborating and sharing ideas for kids' toys, this project really made us stretch and think in an entirely new way." The High Ball creates an immersive, elegant, and easy to use gaming experience. With no complicated settings or button combos, no tiny screens, no unwieldy tablets. It's as versatile and dynamic as you're of a mind for it to be. Just follow the colors and enjoy your High...Ball. Seattle-based Jim Becker is an award-winning toy designer and bestselling author. Lila, his daughter, is a toy designer at the design firm Fugafour in Amsterdam, Netherlands. High Concepts LLC is a startup dedicated to creating products designed to play when you're high. High Concepts has more products in development for release in 2020. High Concepts is located in New York City.